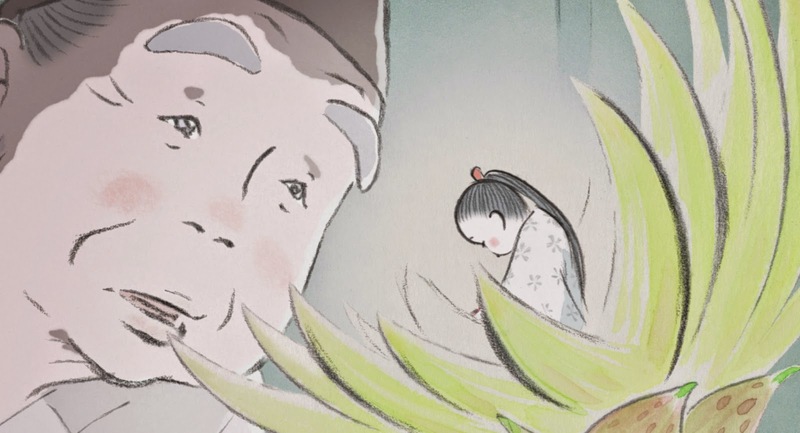 The Tale of the Princess Kaguya is an adaptation of a 10th century Japanese folktale brought to us by the extremely talented people at Studio Ghibli. The man who helmed the project was the very same that tried to break my feels with Grave of the Fireflies. Naturally, I'm talking about the very diversive Takahata Isao. This film was brought to us in 2013 after The Wind Rises (what was to be Miyazaki Hayao's last film before retirement) and could very well be the penultimate Studio Ghibli film as we know it since Studio Ghibli has gone into a bit of a hiatus. It would be a shame if Studio Ghibli called it a day for good, but if they were to then they've certainly left us with a goldmine of excellent animated films. The Tale of the Princess Kaguya being just one of those excellent films. What struck me the most as I sat down to watch in this film in stunning high definition was the animation style. It was just so... different. I've certainly seen a lot of animation styles, but this was probably the most purposefully simplistic I've ever seen. I'm so used to every stretch of the screen being colored in, but this was the exact opposite. There was so much white that I wondered if I was watching a movie or some sort of unfinished anime short that came on before the movie. However, the Ghibli effect can overcome any obstacle. This animation style was not only an artistic statement, but a challenge to the norms of modern day animation. Challenge: Overcome. The style, odd as it was, acted as the perfect foil for the subject matter. This was a very old story and the animation did its all to try to underscore that idea and it worked. It's very beautiful. Of course, it's very style can put off a lot of people that want something more conventional or modern. I still remember all of the people that decried the anime adaptation of Flowers of Evil because it utilized rotoscope. In both cases different was not only good, but exceptional. The story of Kaguya was previously unknown to me, but the story is definitely one of those archetypal stories that seems to be familiar in some way. That may sound like obfuscation, but it was as if I recognized parts of the story from the stories it influenced. The story is thus: A bamboo cutter discovers a young girl in a bamboo flower. The girl can fit in the palm of his hand. Believing himself to be blessed he takes the girl into the palm of his hand, but as soon as his wife touches her she transforms into a baby. Together they raise her, but she grows quickly and the bamboo cutter vows to turn her into a regular princess by taking her into town. It sounds silly saying "I don't want to spoil it" because this is a story from the 10th century, but if you want to know what happens next you can watch the movie (or any of the other adaptations... of which there are many) or Google it. Or try reading an English adaptation of the story itself. This movie was excellent. Very relaxing, too. There's nothing remotely like fanservice. There's no action, either. Not even a single explosion. It's just pure unadulterated animation and storytelling the way it should be. In other words: Studio Ghibli-style.